Membrane proteins play key roles in cellular physiology, and they are important drug targets. Approximately 25% of all genes identified in sequenced genomes are known to encode membrane proteins; however, the majority have no assigned function. Although the resolution of soluble protein structure has entered the high-throughput stage, only 100 high-resolution structures of membrane proteins have been described until now. Lactococcus lactis is a gram-positive lactic bacterium that has been used traditionally in food fermentations, but it is now used widely in biotechnology for large-scale overproduction of heterologously expressed proteins. Various expression vectors based on either constitutive or inducible promoters exist. The nisin-inducible controlled gene expression (NICE) system is the most suitable for recombinant membrane protein expression allowing for fine control of gene expression based on the autoregulation mechanism of the bacteriocin nisin. Recombinant membrane proteins can be produced with affinity tags for efficient detection and purification from crude membrane protein extracts. 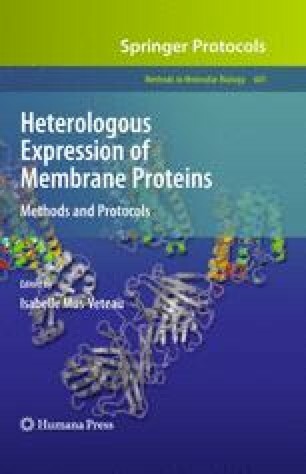 The purpose of this chapter is to provide a detailed protocol for the expression of membrane proteins and their detection using the Strep-tag II affinity tag in L. lactis. This work has been supported by the Commissariat à l’Energie Atomique (CEA-PM project, A.F., S.B., and N.R.). We thank Shaun Peters and Daphné Seigneurin-Berny for critical reading of the manuscript. We thank Igor Mierau (NIZO, The Netherlands) for kindly allowing us to illustrate this chapter with the figure on the NICE system.